In a liver biopsy (BYE-op-see), the physician examines a small piece of tissue from your liver for signs of damage or disease. 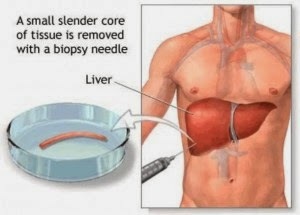 A special needle is used to remove the tissue from the liver. The physician decides to do a liver biopsy after tests suggest that the liver does not work properly. For example, a blood test might show that your blood contains higher than normal levels of liver enzymes or too much iron or copper. An x ray could suggest that the liver is swollen. Looking at liver tissue itself is the best way to determine whether the liver is healthy or what is causing it to be damaged. Liver biopsy is considered minor surgery, so it is done at the hospital. For the biopsy, you will lie on a hospital bed on your back with your right hand above your head. After marking the outline of your liver and injecting a local anaesthetic to numb the area, the physician will make a small incision in your right side near your rib cage, then insert the biopsy needle and retrieve a sample of liver tissue. In some cases, the physician may use an ultrasound image of the liver to help guide the needle to a specific spot. Trans venous biopsy involves inserting a tube called a catheter into a vein in the neck and guiding it to the liver. The physician puts a biopsy needle into the catheter and then into the liver. Physicians use this procedure when patients have blood-clotting problems or fluid in the abdomen.